Like many aspiring members of New York’s chattering class (I’ve got the chattering down; it’s the class I still struggle with), I’m a supporter of WNYC, the local public radio station, and as a membership perk, I also receive an annual subscription to that apotheosis of left-liberal literary journalism, The New Yorker. There was a time, I’ll admit, when I found The New Yorker a bit much to take. Too dense, perhaps, a little full of itself? Or, perhaps I lacked the depth or patience to appreciate it? 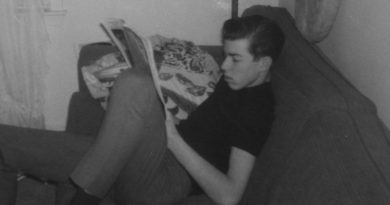 Whatever the reason, my thinking has changed, perhaps as a result of living in New York, more likely from getting older, and I have become one of those people I used to taunt and skewer for their pretentiousness, a devoted, dedicated, cover-t0-cover reader. When I have time, that is. I’m that unlikely individual who often complains that his subway rides are too short, because it’s on the subway that I do most of my reading. Apart from an occasional one-page Shouts And Murmurs or an item from Talk Of The Town, it’s a rare New Yorker feature that can be consumed between Williamsburg and Manhattan, even if the train is late in arriving and I’m riding all the way to 8th Avenue. The unfortunate result is that I always have a stack of two, three, sometimes five or even ten New Yorkers sitting on the kitchen table waiting for me to do some catch-up reading. At points it gets ridiculous: it was snowing heavily the day I finished the issue with the midsummer beach-themed cover, and we were homing in on Valentine’s Day when I tackled October’s coverage of the Presidential election. Few publications had so vociferously and persistently ridiculed and vilified Mitt Romney; since I believed this to be a fundamental duty of any reputable media outlet, I wasn’t about to miss anything The New Yorker had written about him. I was chagrined to find a thoughtful and insightful Nicholas Lemann piece about the now all but forgotten candidate that had me on the verge of thinking maybe Romney wasn’t so bad after all. I thanked my lucky stars that I hadn’t read it before voting, because I get a lot more enjoyment out of casting my ballot when it’s unambiguous. Then I moved on to a profile of J.K. Rowling, an author I admire greatly because, well, all right, because I enjoyed the Harry Potter series greatly, but also because of her success in turning a generation of children into voracious readers when, in the age of ubiquitous electronic media, you wouldn’t have thought that possible. And the more I read about her, the more I liked her and the more I enjoyed the article. What a truly ugly—and idiotic—statement. I hadn’t heard of this Taylor fellow before, so I looked him up. Seems to be about my age, seems to be embittered that life has been or is about to begin passing him by, and can’t pass up an opportunity to try to impose his time-tattered, threadbare values on a generation younger, smarter and better-looking than his own. Let’s be honest: any of us who’ve reached a certain age has also acquired certain ideas, ones we’re sure would greatly improve the quality of, well, practically everything, if only the nincompoops in charge could be compelled to put them into effect. Foremost among such ideas tend to be those beginning with “When I was your age” and consisting almost entirely of prescriptions for how today’s young people could more profitably and pleasurably comport themselves. Whether it’s urging them to study hard and pick a good university, or to acquire a couple of STDs and a drug habit before considering themselves “done” with high school, it’s inevitably reads like the sour-grapes wisdom of people who didn’t get to do everything they wanted when they were young, and so are now demanding that the next generation carry on where they left off. I’m as guilty of this as anyone my age, but in my defense, I’m at least conscious of the tendency, and try to rein it in. Not so this Taylor character, who, not content with rubbishing the joy brought to literally hundreds of millions of readers by the Harry Potter series, suggests that that joy should be replaced by the tedious clichés of his own pseudo-rebellious youth. Was there once something to be said for “shagging behind the bike shed, smoking marijuana and reading Camus”? No doubt. After all, Taylor (and I) grew up in a time when, at least for a while, there wasn’t a lot else going on. But we live in a bolder, brighter world today, one that presents infinitely more options to young people, whether they be of a rebellious bent or (and I think this is what really gets to curmudgeonly aging baby boomers like Taylor) they’re actually rather happy with their friends, families, schools and life prospects. Obviously shagging is never going out of style, but the furtive and often disappointing and destructive liaisons behind Taylor’s beloved bike sheds are as often as not being replaced by open and loving relationships that don’t have to be hidden away or hastily conducted. Marijuana? Well, I tried it. In abundance, as did most people I knew. Some of us managed to get through it all right, even after we were sure we’d seen God and been assigned a special mission that just happened to be incomprensible to parents, teachers, authority figures and, truth be told, ourselves. Many of us didn’t do so well: a great number of damaged individuals, incapable of carrying a coherent thought from one end of a sentence to the other, can be seen picking their way disconsolately through the garbage cans—figuratively or literally—of Main Street America. And Camus? Come on, it’s the 21st century. Yes, it seemed very daring and radical back in the day to slog through a bunch of French gobbledygook in hopes of appearing “intellectual,” but seriously, who needs that crap today? Certainly not kids who enjoy their lives and don’t confuse angst with authenticity. Sure, kids will always find ways to screw up as well as ways to pursue ecstasy (I don’t mean the drug, though I suppose for some it will work that way) and enlightenment. But let’s let them find their own ways, and stop trying to shoehorn them into the corny scenarios just because they seemed exciting to us half a century ago. 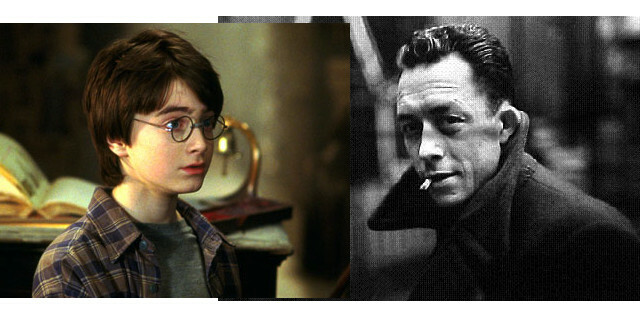 And for the record: I read Harry Potter in my 50s, Camus in my 40s. I learned far, far more from Harry Potter. Love this. I’m a middle-aged post-punker / RiotGrrrl who works at a university, and I have to say that the kids I come into contact with are mostly all very earnest and eager to change things for the better. I get the same vibe from friends’ kids (in or out of university). They volunteer and participate in social-service activities that I didn’t even know existed when I was 18 or 19. I think of how I would have laughed out loud at kids like this if they were my comtemporaries, and I feel ashamed.